A visit to India is unlike any other place one can visit in the world. The birthplace of one of the oldest civilization, India's historical and archeological sites are simply marvelous, whether it is the mystical Taj Mahal, the magnificent Delhi's Red Fort, or the stunning Akshardham. Need a reason to come to India? We think not. But here are more reasons why you should visit India. India provides a cultural weave that is hard to rival. Decadent food delicacies and spicy curries, Indian food will be one your fondest memories. There's nothing like Indian hospitality. There's a saying in India, "Athithi Devo Bhava", which means "the guest is God". Indians consider it a huge honor to have guests and go out of their way to please them. India is also well known for its amazing shopping experience be it clothing or handicrafts. Crisp cottons, luxurious silks, hand woven and embroidered, or western brands at Indian prices, shopping rarely gets this good. For all its historical roots, India is well provided with every modern facility to make your stay completely comfortable; be it excellent transportation network, high-speed internet or one-of the best cell-phone coverage in the world. 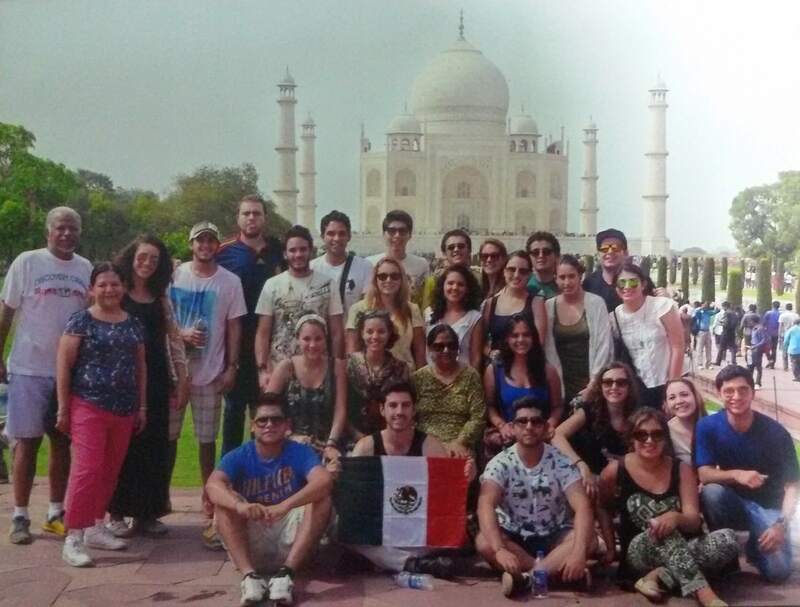 Our 3 city study-abroad program starts in Delhi, the capital of India and then takes you to the iconic Taj Mahal in Agra, and finally to Jaipur, the cultural center of India. India is a magical place that everyone should visit at least once in their lives. Check out our photos from earlier programs. We advise you to register atleast 8 weeks before the start of the course to cover for any challenges in getting visa, flights and hotel accommodation. To register, please email your interest to contact@multinationalacademy.com. Once confirmed, you need to pay the registration fee of US $400. This fee is non‐refundable and will be deducted from your total program fee. The remaining program fee needs to be paid atleast 8 weeks prior to the start of the course. We accept payment through bank transfer, PayPal and Credit card. Please contact us for details. English is commonly spoken so language should not be an issue. However, a few Hindi (India’s national language) phrases will definitely help break the ice. Don’t worry, our study-abroad course includes an introductory class on commonly used Hindi phrases. As for money, you will be dealing in Indian rupees – there are about 65-70 rupees to each US Dollar. Credit cards are accepted, but make sure you know all your pin codes. You can also exchange your US dollars in India through authorized currency exchanges. India can get reasonably cold in winter and pretty hot in summer. Make sure you check the temperature forecasts and pack your clothes accordingly. Dress conservatively (loose ankle-length pants or long skirts, tops that cover your neck and shoulders). Make sure your health insurance is valid internationally and your vaccinations are all up to date. Carry a medical kit with general medicines/antibiotics. Our program guides will be carrying basic medical supplies in case you need them. All of India simply cannot be experienced in two weeks, two months, or possibly even two years. Pick and choose what interests you in case you want to extend your stay in India. Our program is designed to maximize your time in India. Above all, have an open mind. India can be a sensory overload, but trust us, it will be one of the most fascinating adventures in your life. Check out our testimonials for feedback from past participants. Unfortunately, India has received some negative publicity recently in regards to women’s safety. Admittedly, India can be an uncomfortable country for foreign females travelling alone. However, the good news is most parts of India is very tourist friendly. Rest assured, student safety is one of the cornerstones of this study-abroad program. Over the past few years, more than half of our program participants have been females.